Load our free iPad game and try to conquer all the challenges. 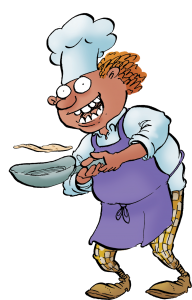 Watch the chefs as they dance around the kitchen and as soon as you see a pancake lift out of its pan – squirt it with syrup and splat it on the wall! Tilt your iPad left and right to move your goal keeper and save goals. Can you survive more than a minute in the Plane Challenge? You’ll need lightening fast reactions and superb precision to knock these paper planes from the sky.